Learning how to paint a house is useful for any homeowner – updating the look of your home doesn’t have to be a very costly process and painting your place inside and outside is a very affordable and fun way to refresh the appearance of your home. There are great painting companies that work hand in hand with the construction companies in Denver that come highly recommended, if you don’t feel like tackling such a huge job. You need the best paint that you can afford and the most suitable hue, inside and outside as well. The two most common types are oil-based and latex-based paint – oil-based paint works best for wood surfaces and as a base for a latex top coat because it has better sealing properties, while latex paint is suitable for most household uses, but be prepared that it takes longer to dry. When you choose your paint, you need to make a decision about the level of glossiness, especially for the paint you will use inside. Paints are different in terms of sheen as well. As a general rule, the glossier the paint on the wall, the easier it is to keep clean. High-gloss paint is the best choice for heavy-traffic areas, such as playrooms, semi-gloss paint, such as satin-style varieties, work best in kitchens and bathrooms, while matte paint is the best if you have a wall with imperfections that need to be concealed. 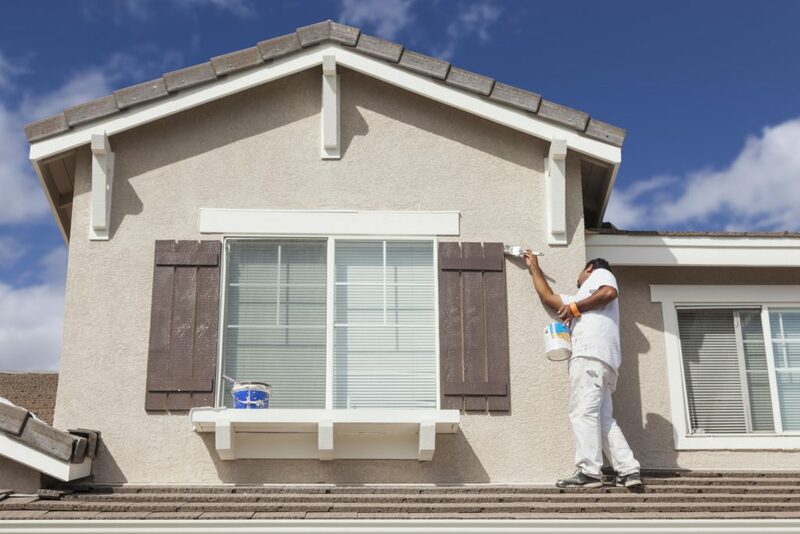 The aspects to consider when you choose the paint for the exterior of your home should include durability, weather-resistance, easy cleaning and the ability to cover chips, dents and other imperfections. Latex paint meets all these requirements, but if you need to work on wood, oil-based paint may be more suitable. Whether you will be painting inside or outside, you need to prepare the area that you will work on before you start painting. If you start inside, empty the room and cover the floor; if you paint outside, cover the ground around the wall as well as the objects and the vegetation in the area. The next step in both cases is wall cleaning. Make sure you remove all of the old paint, then wash the wall with some mild detergent and water and rinse it, too. If the wall has cracks or holes, fix them with some caulk, then sand the caulked surface to make the entire wall smooth. Start painting only when the wall is completely dry. Calculate how much paint you need for your project, then mix it all in one large container to avoid color inconsistencies. Make sure your painting tools are of the best quality – use a large roller with an extendable handle for most of the wall, but get some brushes ready as well, for the tighter or more sensitive areas, such as corners. While painting, always move vertically, from the top toward the bottom to be able to fix any streaks or drips as you move towards the ground. The best way for learning how to paint a house is by actually doing it – if you feel that you need some practice, start in a room that doesn’t get too much traffic or on an exterior wall that is not very conspicuous and move to the more sensitive areas when you have confidence in your painting skills.